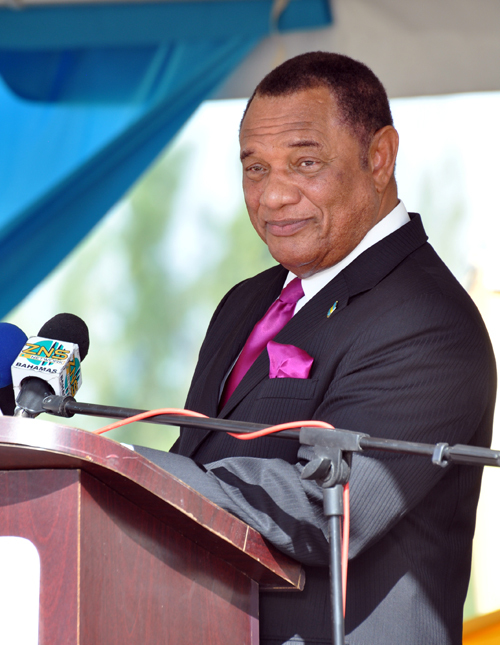 FREEPORT, Grand Bahama - Prime Minister of the Bahamas, the Rt. Hon. Perry Christie, and members of his Cabinet were in Grand Bahama on Friday, December 18, for the historic contract signing and ground breaking ceremony for the new causeway which will replace the Fishing Hole Road. The contract, awarded to All Bahamas Construction Company, in the amount of $6,553,584.89, inclusive of VAT, is expected to be completed by January, 2017. The Fishing Hole Road has hindered transportation between West Grand Bahama and Freeport during adverse weather conditions for many years. The Prime Minister said of the occasion, "today, we are all together on this particular occasion, that is a very important one for the people of this island." Minister for Grand Bahama, the Hon. Dr. Michael Darville, he said, dedicated himself to finding a resolution to the problem of the Fishing Hole Road. The Prime Minister congratulated him for his efforts. 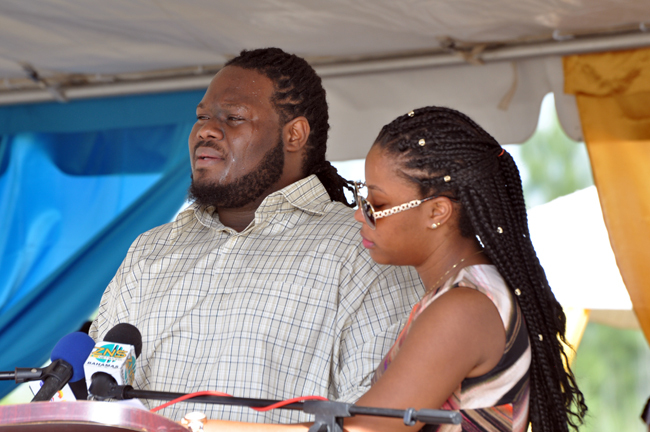 He said it was time to focus on the people of Grand Bahama. The Prime Minister then touted some of the projects for the island. The extension of duty free concessions to East and West Grand Bahama, and some 76 businesses have benefitted from this. The government is faced with implementing National Health Insurance. In order to prepare for this, government clinics have been renovated and the Eight Mile Rock Clinic has extended its hours. This has relieved the burden placed on the Rand Memorial Hospital. The contract for upgrading of the clinic in West End will be given in January: it is the only clinic that remains to be upgraded. As National Health Insurance will be implemented, clinics in New Providence will also extend their hours. There will also be a new school in West End with sporting facilities. It is hoped the contract will be announced next year. The Carnival Cruise Port is about two weeks away from completing the Heads of Agreement. The project for East Grand Bahama, said Prime Minister Christie, will stimulate the area as it is a new destination being created and linkages will be created around that port. There will also be a debate on 'aragonite' and yesterday, he continued, he indicated that the government will now access the science behind aragonite to determine if it can be an export industry in the country. Aragonite, which is a form of sand, is used to manufacture a number of items. "Two of the major entities involved in the processing of aragonite are both indicating that they would like to centre their manufacturing activities in Grand Bahama." The Prime Minister assured those present that the "beginning of the turn is in evidence." In East Grand Bahama, Deep Water Cay will be expanding as well as adding a new hotel chain, Six Senses, which will be coming to The Bahamas for first time. In mid January, it is expected PharmaChem will break ground for their expansion. "Things are happening," he said. "There's every reason to believe we are beyond the stage of making promises to people, we are at the stage of executing commitments." Two days ago, continued the Prime Minister, Mediterranean Shipping Company Limited (MSC) agreed to develop Ocean Cay. As the second largest ship builders in the world and partners in the Container Port, they have $6B worth of cruise ships on order and $10B worth of cargo ships on order. Along with the Container Port, MSC will expand the Container Port into Phase 5, a $250 to $300M investment. More importantly, he said, hundreds of new jobs will be created for Bahamians. "But MSC has said something else. In consideration of the government agreeing to have a destination on Ocean Cay, they are going to begin an academy to train Bahamians in Freeport beginning early next year, working in tandem with The College of The Bahamas and the National Training Agency, and they talk about a total of 450 young Bahamians who will be recruited and have the opportunity to work on their ships." He said that in coming to Grand Bahama for this occasion, he wanted to thank all of those people who prayed for, and those who worked together to make the causeway happen.